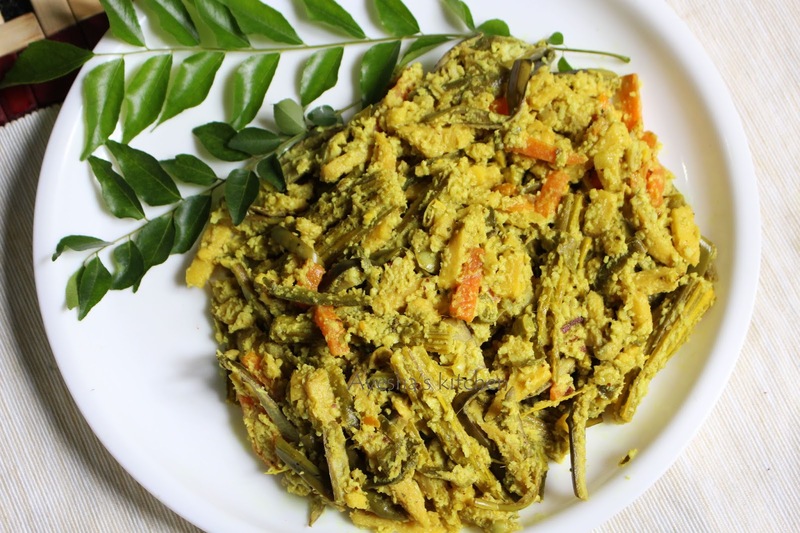 Aviyal is a traditional and popular dish of Kerala (South India). Onam / Vishu sadya or kerala sadya ( feast) is incomplete without Avial. It is delicious as well as healthy with the combination of vegetables in coconut curd mixture. It is very simple to make ans served as an accomplishment to rice. Pachadi, olan, kaalan, erissery, payasam ,sambar, rasam are some other dishes served along with kerala sadya. Here lets see how to make kerala style Aviyal recipe. 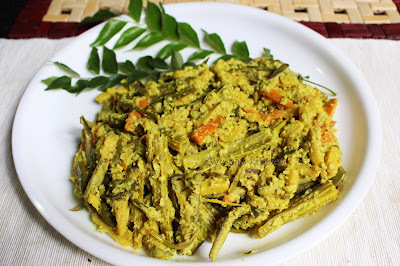 Do try and enjoy..
Wash the vegetables well and cut the vegetables length wise (make thin slices). Now add this sliced vegetables in a wok along with turmeric powder and cook the vegetables with lid closed. Add quarter cup of water to the vegetables. Do not add more water. The veggies will itself release water once heated. When the vegetables are almost done and the water is dried almost, then add the well whipped curd along with some salt and let it cook for some time. Meanwhile crush together coconut, green chilies, cumin seed. Only course grind is needed like we grind for thoran. Now add coconut mixture and mix well gently. Then level it evenly and let it cook for few minutes in a low flame. Finally top it with 2 tbsp of hot coconut oil and curry leaves. Close the lid and let it stay for few minutes.